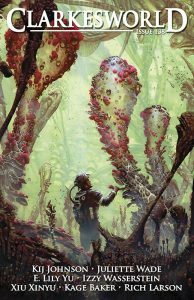 The best story in the March Clarkesworld, and one of the best stories published so far this year, is “The Persistence of Blood” by Juliette Wade. This is a novella set in the midst of a complex alien culture made up of several different, rigidly enforced castes (as far as I can tell, no humans appear in the story), with the protagonist, Selemei, a member of the aristocratic First Family, wife to a high government official, Xeref. The aristocrats have iron-bound traditions about birthing, believing nothing is more important than passing on their blood to the next generation, but in spite of these tradi­tions, or maybe because of them, their numbers keep falling. Selemi herself was crippled and nearly killed by her last childbirth, and knows that giving birth to another child will probably kill her. She’s torn between her fear for her life and desire for her husband, because birth control is forbidden among the aristocrats, and the fact that her not having new children to further the bloodline is hurting her husband’s political career and diminishing his influence. Xeref is reform-minded, largely motivated by concern for his wife’s welfare, and has pro­posed wide-sweeping legislation to deal with some of the worst of the traditional birthing system’s problems, but he dies suddenly before his proposal can come to a vote. It’s then up to Selemei to try to claim her husband’s seat in the legislature and bring Xeref’s legislation to a vote, in the face of massive disapproval, opposition, and resistance from the rest of the law-makers, who are angry and appalled at the idea of a woman participating in the traditional all-male Congress. Will Selemei somehow be able to gain enough allies to succeed, or are her efforts doomed to failure? “The Persistence of Blood” is strongly remi­niscent of C.J. Cherryh’s work, and if you like Cherryh, you’re likely to enjoy this story too. Also good in the March Clarkesworld is “Tool-Using Mimics” by Kij Johnson, an entertaining bit of metafictional speculation about the squid children, or human/squid hy­brids who may move among us, successfully passing themselves off as human. Xiu Xinyu‘s “Farewell, Adam” is about a media-created star controlled behind the scenes by a gestalt personality made up of various individuals who struggle with each other for dominance, something like a somber and less flamboyant version of James Tiptree, Jr.’s “The Girl Who Was Plugged In”. Izzy Wasserstein‘s “Un­places: An Atlas of Non-existence” is another metaphysical study, less playful and entertain­ing than the Johnson, a catalog of places that don’t exist anymore or never did exist in the first place. E. Lily Yu‘s “The No-One Girl and the Flower of the Farther Shore” is a melancholy fantasy about a penniless Chinese orphan girl who grows a very unusual kind of flower on her grandmother’s grave, and how, after losing everything, including her earthly life, she finally reaches a sort of transcendence through those flowers, which begin to grow everywhere. The March Lightspeed is a strong issue. 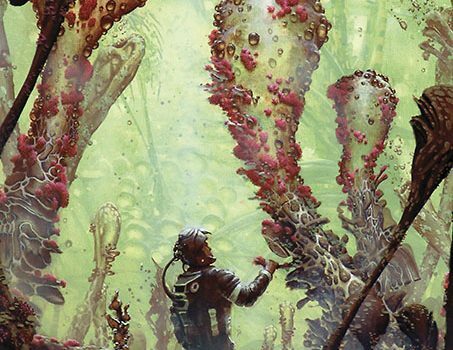 In “Cosmic Spring“, Ken Liu musters all his considerable powers of imagination and lyri­cism to take us on a trip to the very end of the universe. And in “The Independence Patch“, new writer Bryan Camp does a commend­able job of painting a portrait of a mentally enhanced cyborg who is continually in com­munication with the internet, whether he wants to be or not, and who must struggle every day to adapt to the world of “normal people” who surround him and with whom he must interact. Quiet and compassionate, this one reminds me of some of John Sladek’s work along the same lines. The March/April F&SF is an average issue, with some good stuff in it, but nothing that’s really outstanding. 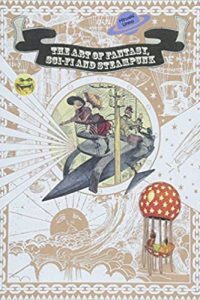 Best story here is probably Andy Stewart‘s novella “Likho“, a sequel to his “Wormwood Is Also a Star” from the May/June 2013 F&SF. Both stories deal with supernatural or perhaps mystical or psychic events that take place in the heavily radiated Zone of Alienation after the meltdown of the Chernobyl reactors. This is a complex story with lots of suspense and complicated human interactions, although it may be a bit difficult to grasp if you haven’t read “Wormwood Is Also a Star”. Also good here is Charlotte Ashley‘s “The Satyr of Brandenburg“, a sequel to her story in the March/April 2015 issue that introduced us to the deadly female duelist La Héron. This adventure is based on the historic fencing exhibition between the Chevalier de Saint-Georges and La Chevaliere d’Eon in 1787, and reads much like something by Alex­ander Dumas – except that in Ashley’s world, magic is real, the realms of Faerie touch Earth, and the dueling tournament features all sorts of supernatural creatures, some of whom may be using their powers to cheat. There’s little real science fiction in this issue, but the best of what there is to be found is to be found in new writer Ted Rabinowitz’s first published story, “A Dog of Wu“, which sets up an interestingly complex future world of rigidly controlled biological clades and clashing philosophies, and G.V. Anderson‘s “Down Where Sound Comes Blunt“, which has an intriguing set-up about an expert linguist investigating a race of intelligent merpeople, called “selkies,” who live at the bottom of a frozen-over glacial lake, and also trying to find her father – or at least his remains – who disappeared while also investigating the same colony of selkies. Some compelling stuff here, but I don’t think the last line reveals all and solves all mysteries in quite the way that Anderson thinks that it will, and I put the magazine down with questions as to just what was happening still unanswered. Wil­liam Ledbetter‘s “The Beast From Below” is an amiable semi-satire on the giant monster movies of the ’50s, although Ledbetter makes no real progress on rationalizing the science except to throw the word “radiation” around, just like they did in those old movies; still, it’s a pleasant-enough bit of light reading. Susan Palwick‘s “Hideous Flowerpots” comes close to being a straight mainstream story – the only real fantastic element in it is a magic measuring tape, the origin of which is never explained – but it’s an engrossing read, dealing with a woman in psychological crisis who is dragooned into reluctantly attending a meet­ing made up of women who have gone through similar emotional meltdowns of their own. It could certainly have been told as a mainstream story, though, without the magic measuring tape, and lost little or nothing in the telling.